President-elect Donald Trump has threatened to slap big tariffs on China and Mexico to help bring jobs back to America. At first glance, it may seem hard to do without backing from Congress. But actually, Trump doesn't even need Congress to approve it. True, the Constitution gives Congress the right to impose tariffs on other nations. However, several complicated laws have been passed in the last 100 years that delegate that power from Congress to the president. Trump has several options -- each open to interpretation -- but here are three key ways he can go after China and Mexico. Trump could invoke the "Trading with the Enemy Act of 1917" to hit Mexico and China with tariffs as high as he wants. Under the law, the president can restrict all types of trade "during time of war." That definition is very loose though. America doesn't have to be at war with China or Mexico -- it just has to be "at war" somewhere in the world in order to apply tariffs against China or Mexico. Experts believe U.S. special forces in Syria and Libya would suffice to meet that requirement for Trump to hit China and Mexico with tariffs. All to say: the excuse of war has very loose meaning for the President to raise tariffs of any kind. Think that law is too outdated for Trump to use? There's another -- the International Emergency Economic Powers Act of 1977. It gives the president authority to use tariffs on another country during a "national emergency." Again, defining an emergency is vague. 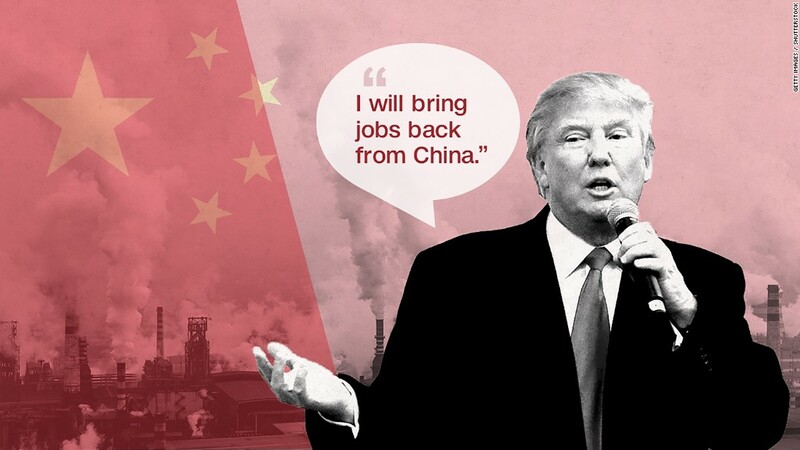 Losing manufacturing jobs to Mexico and China would suffice as one and courts have never rejected a president's reasoning. "You say 'it's an emergency, we've lost a lot of jobs and now I've got to act. I declare an emergency.' I think it's really that simple," says Doug Irwin, a trade expert at Dartmouth. "If he wants to threaten China or Mexico, he has a lot of leverage." The big difference between this Act and the one from 1917 is that Trump can't seize assets using this one, but that's not his aim anyway. This law has been invoked against Nicaragua, Panama, Sierra Leone and Somalia, according to the Peterson Institute of International Economics. It was used "in circumstances that few observers would characterize as an 'unusual or extraordinary threat," says Gary Hufbauer, an economist at PIIE. Trump can also impose tariffs on everything under another law -- the Trade Act of 1974, Section 122. It gives him authority to impose across-the-board tariffs. Trump just needs to find "an adverse impact on national security from imports." Lost jobs could be an adverse impact. The caveat: The tariff can only be up to 15% on all goods and it's only good for 150 days. Then Congress needs to approve it. So, it's a blunt rule that could have a severe short term impact but it expires after five months, unless it is extended by Congress. In short order, if he wants, Trump can raise tariffs of 35% on Mexico and 45% on China. It's easier for him to go after China first because he would need to tear up NAFTA before he could slap stiff tariffs on Mexico. However, if Trump hits these countries with tariffs, it shouldn't be a surprise if they retaliate with trade barriers of their own against America. "If he imposes high tariffs, even as a threat or tactical maneuver, foreign countries will soon retaliate," says Hufbauer, the trade expert.